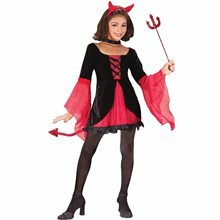 Devil Girl Child Costume.Includes: Dress with Jagged Edging and Red Sash. 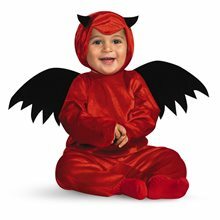 Available Size: Child - Small (4-6), Child - Medium (8-10), Child - Large (12-14). (See Size Chart For More Information) *Ears, Headband, Pitchfork and Boots Not Included. Accessories Sold Separately. Features dress with Jagged Edging and Red Sash. 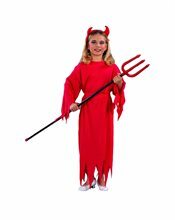 Devil Ear, Headband, Pitchfork and Boots Not Included. 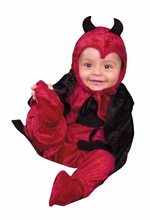 Devil Darling Costume; Devil Darling costume is red in color.It comes in Size(s):Child S (6-8), Child M (8-10) The costume Includes: Dress, Horns, Tail, Wings, Pitchfork. 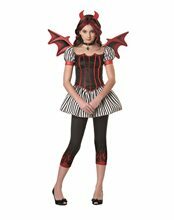 Bride Of Satan Girls Child Costumes;Costume includes: Flowing, drop sleeve dress with chain accent detailed front, gothic cross necklace and horned headpiece.Available in Small size (4-6).